My 5yo pupil, Magnus, is playing his first chess tournament. Although I missed his first game, @Elder helped me reconstruct this important first win from the few clues I could collect. Alas, the second round started when I was still reading @Elder useful answer on Puzzling.SE, and I missed the action again! When I reached the playing hall, Magnus and his opponent, a 7yo girl, were already putting the pieces back in their starting places. Luckily, Magnus' bright smile left me no doubt about the result: he won again. He was Black this time, and the five bars in each column (for White and for Black) on his scoresheet prove that, once again, the game was a very short one. "I took her rook with my knight, hop! I was already so happy to eat a rook, but moreover, after I played it, I noticed that I was attacking her king, and she had no escape... Checkmate, I won again! -Impressive, congratulations, Magnus! Err... Do you remember what happened before ? -Hmmm, not quite, the board is so big... At first I was a bit afraid because she is taller than me, and she started with the pawn in front of her king, two squares - I remembered you told me this is a great move to start with, so I thought she must be very strong to find it. But then I just played a few moves, and my horsey ate her rook, and wow, checkmate!" I could not get any more details about how the game went, so once again I need to ask you to help me and reconstruct what happened. Hints will be provided later (if need be). The opening starts with Alekhine's defense by 1. e4 Nf6, but instead of common 2. e5 White continues with 2. f3 which weakens kingside position. Also 2. ... Nxe4 is a risky move because White may use 3. fxe4 with material advantage. 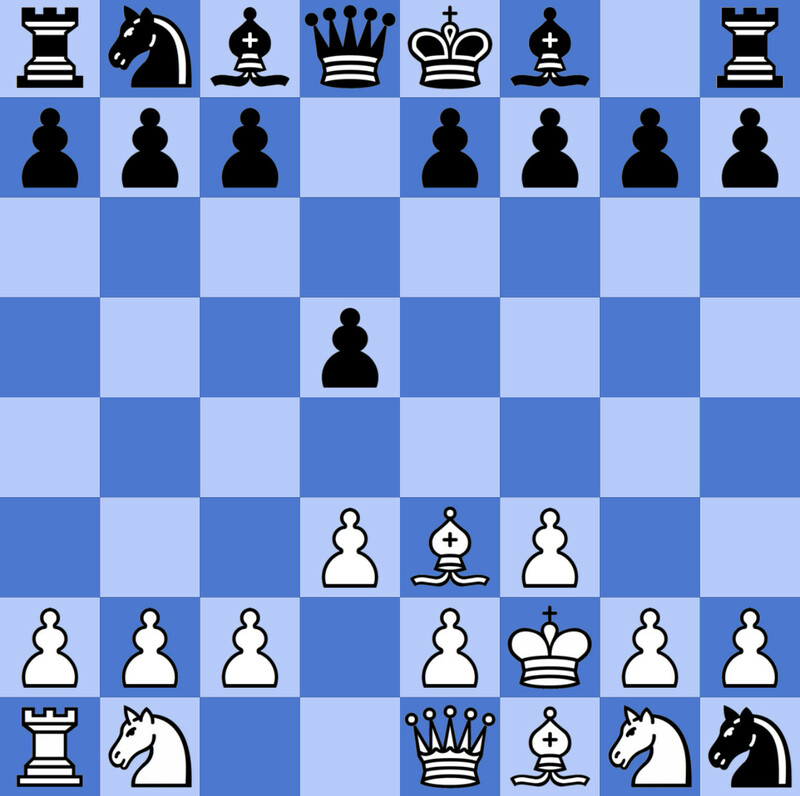 The most possible move with M5 for Black includes a mistake and a blunder (with 4. Qxe7 loses White's queen immediately and the king unable to occupy e-file, then capturing White's h-rook produces checkmate). This fails because 3... Nxc2 is check and White needs to respond to that.